I have often said in the past that, given the choice, I would rather be DX than work DX, and despite all the new countries that have come along my way recently (1S, ST0, KH5J, 3D2/c, 7O) I have been missing the thrill of being on the receiving end of a decent-size pile-up. When talk in our household turned to where to go for our annual holiday this year, a place where I could take a rig and get a licence and – hopefully – a pile-up was in the back of my mind. Scanning through the glossy brochures we found that June – when Eva and I had our leave booked – was very much the low season in the Caribbean, and some very good bargains could be had. Once we had decided on the Caribbean area, it only had to be decided which island to go to. The brochures were full of accommodation in Barbados (but 8P is pretty common) and Antigua (which I had visited in transit six years ago en route to and from Montserrat, where I was one of the VP2MW contest team) and a few companies also went lo St Lucia, Grenada and the Grenadines. The Grenadines in particular looked beautiful, but were very expensive. 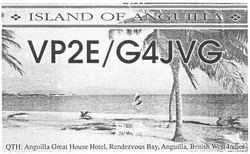 Just two brochures also listed Anguilla, which I have never heard of as a holiday destination before. I didn't know anyone that had been there, which made it even more attractive, and – being the low season – one place, the Anguilla Great House, was offering two weeks' accommodation for the price of one, as well as a US $50 per person free bar credit. Having been to the Caribbean before, I knew how expensive eating and drinking was there, so this seemed to be the ideal place to stay! A booking was made, followed by a letter to the manager, explaining a little about amateur radio and what I hoped to do at his hotel. I said l would phone a few days before leaving to see if he had any queries and to check that it was OK with him for me lo bring my gear. Meanwhile, I phoned the RSGB to ask about reciprocal licensing on Anguilla. The person I spoke to had clearly never heard of the place, at first thinking I was talking about Angola, then – when I explained it was in the Caribbean – telling me that it was called Antigua, not Anguilla. When I explained that it was still a British island and that it was very definitely called Anguilla she said that if it was British it would have a VP2 prefix (ah! – now we're getting somewhere, I thought!) but the only places with VP2 prefixes were the British Virgin lslands and Montserrat, so Anguilla must now be independent . . . 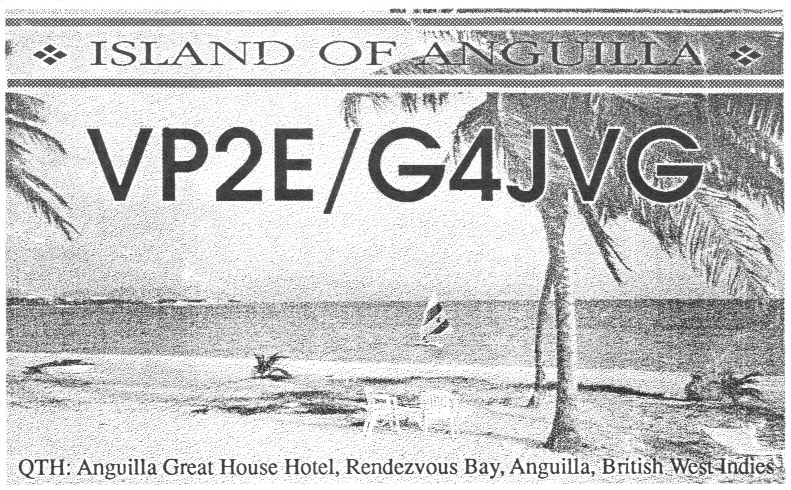 I tried the DTI amateur radio section and was told that there was no reciprocal licensing agreement between the UK and Anguilla, but that Cable and Wireless issued licences there and that I could try writing to them. The DTI were very helpful, they even had an address for Cable and Wireless on Anguilla, so I wrote to them and waited, and wailed . . . Meanwhile, I wrote to Paul Meacham, VP2EXX, the only active amateur on Anguilla of which I was aware, and explained my problem. I had worked Paul a few times and knew him to be a keen contester and DXer, so suggested we should meet when I got to Anguilla, as I knew we would have a lot in common. Paul was very helpful, and told me that Cable and Wireless hadn’t issued licences for many years, they were now issued by the Department of lnformation, who also run the government radio station, Radio Anguilla. He told me the name of the person I should contact, and even let me know his phone number. I phoned Menes Hodge, the director of Radio Anguilla, and asked him about licensing. As I suspected, there was no problem at all, once you knew who to contact! All you have to do is take along your home licence and pay the fee, which is a rather hefty 100 East Caribbean dollars (about £22), and you’re on the air. However, it is not possible to get your licence before leaving, so l was not able to let anyone know callsigns etc. Also, because we arrived in Anguilla on a Saturday and Mr Hodge works normal office hours I could not get on the air until Monday. I had packed the TS-430S, PS-430, about 80ft of RG58 coax, fist mic, lightweight headphones, a CB type SWR bridge and a little Sony ICF-7600DS general coverage receiver with its PSU into a small suitcase, the dimensions of which are the maximum permitted on aircraft as hand baggage (in fact the above contents fit perfectly – if tightly – into such a case). The antenna – a Butternut HF6V-X vertical – was checked into the aircraft hold, along with our single suitcase, after it had been X-rayed by the security staff (l wondered what it must have looked like, with all its coils, tubes and nuts and bolls, but they did not query that it was anything other than a radio aerial). At the hand baggage security check there were the usual questions about what all this equipment was, but they seemed more interested in my proving that the Sony ICF-7600DS worked – fortunately I had put batteries in, so it did. A view of the G4JVG licence convinced the man that the remainder of the gear was not subversive. Taking the rig, power supply etc as hand baggage means that you can be sure they will all arrive in good shape, but I can assure you they do get very heavy by the time you have walked what seems like miles to departure gate 60 at Gatwick North Terminal! We were disappointed that the BA Jumbo did not have Captain Shepherd [G4LJF] at the controls, but nevertheless it was a very comfortable flight to San Juan, Puerto Rico, where we had a six-hour stopover before our two-hour connecting flight in a 16-seater Twin Otter on to Anguilla. At the Anguilla Great House we had been accommodated in a very comfortable room, but unfortunately without any suitable supports for the Butternut vertical. However, it really was the low season, and of the 25 rooms in five separate bungalows only two or three were occupied, so it was no problem to move to a room in an otherwise empty bungalow which had some scrub land at the back with several suitable bushes, large rocks and bits of concrete to which I could attach guy strings. There was also plenty of space for the radials and it was well out of the way (l used just about all the RG58), where no-one was likely to trip over the wires and with just a few goats grazing in the vicinity. To cap it all, there was a large salt lake just beyond the end of one of the 3.8MHz radials, so all in all it looked a pretty good location! On the Monday, we took a trip into The Valley, Anguilla’s ‘capital’, to meet Menes Hodge and get the licence organised. I asked for any available callsign in the VP2E- or VP2E-- series, but Mr Hodge said these were reserved for residents and I would be issued VP2E/G4JVG (l later found out that there are ways and means of getting a ‘proper’ callsign, but it helps if you have been there before, so perhaps next time I will be more lucky!) The bands, modes and power permitted are very much up to you – Mr Hodge asked what bands and how much power I would like to use and wrote these straight on to the licence. It was therefore no problem to get permission to use the WARC bands and if I had had 50MHz gear with me I am sure this would have been permitted too. I had only taken a TS-430S with me, so only requested 100 watts, but feel that if I had asked for 2kW this would probably have been granted just as easily! It was Monday evening by the time I had organised the licence and had got the station and antenna set up – late Monday night GMT – but a short CQ call on 14195 brought back several callers from the States, then a few Europeans and within ten or fifteen minutes a howling pile-up had developed and it became necessary to operate split. This was going to be fun, l thought! After about 100 QSOs l went QRT for dinner, a few drinks, and afterwards bed. The next morning l thought l would try 28MHz, but it was completely dead. Never mind, 21MHz should be good into Europe, or perhaps even Asia at this time of day. No such luck. I worked one or two weak W stations and a couple of YUs and UB5s (it’s funny, but they seem to be the strongest Europeans even over there!) but my CQ calls went unanswered for several minutes at a time. Everyone was commenting that conditions were rather odd. That evening things were just as poor on 14MHz, and the next day things were even worse – it became quite difficult to get any QSOs at all, and by this time everyone was saying how abysmal conditions were. It transpired that there had been a major solar flare two or three days earlier which had had a devastating effect on propagation and its effects were to be with me for most of the two-week stay. After a couple of days of operating I was called by a very strong station – my first VP2E, Dorothea, VP2EE. She was far more surprised to hear me than I was to hear her, as she did not know that there were any visiting amateurs on the island, and Paul had told me in his letter that only he, his father, and Dorothea and her husband Dave, VP2EHF, were active from Anguilla. We arranged to meet and immediately became good friends with Dave and Dorothea. They have retired from the US military to Anguilla and have spent about two years getting their house, at the end of a long pot-holed unmade track, built. It was nearing completion when we visited them in June. Although our tiny Suzuki hire car grounded on the rutted track at the same point on the journey each time we went to and from their house, it was worth the journey. Built on a half-acre site, it is a modern two storey affair, with the most noticeable feature being an electricity generating windmill on lop of a 64ft Rohn tower. Dave says it provides most of their power and helps keep the Anguillan government electric bills low. Another 64ft Rohn tower supports wire dipoles, loops and VHF antennas, although Dave has bought a monster Mosley 7-element beam for 7 - 28MHz on a 40-odd ft boom, which he hopes lo be able to erect very soon. He is also importing another two 64ft towers, on which he will put 5-element monoband beams for 18 and 24MHz, his two favourite bands. At present he has a quad loop for one of these bands on the windmill tower and a 5-ele Yagi supported temporarily on the remains of a Hy-Gain ‘High Tower’ vertical, which didn't seem to work – despite burying thousands of feet of radials. Add to this a Butternut vertical, a short roof tripod tower with a 6m beam and various other antennas and it already looks fairly impressive – when all four 64ft towers are up it should be quite a sight! Dave and Dorothea’s closest neighbour – at the end of this awful pot-holed track, miles from anywhere, is another beautiful modern villa, this one with a Cushcraft A4 on the roof. This belongs to Fritz, HB9SL, but he only visits Anguilla a couple of times a year and the house is empty most of the time. Apparently Fritz has plans to put up a 100ft tower with HF monobanders. There is not much in the way of sightseeing on Anguilla, the interior is relatively unattractive and most of it is scrubland. Most people go to Anguilla for the beaches, which are among the best, if not the best in the Caribbean, and the friendliness of the people. Rendezvous Bay, where the Anguilla Great House is situated, is a two-mile long crescent of brilliant white coral sand, fringed with palm trees, on the south coast of the island with beautiful views across the Caribbean to Saint Martin / Sint Maarten (FS/PJ), the joint French / Dutch island, about six miles away. Rendezvous Bay was completely deserted while we were there and even in mid-winter, the height of the tourist season, Dorothea said it was usually empty. Beaches on the north coast are slightly more populated, as they provide excellent snorkelling on the coral reefs. There are also several small islets with splendid names like Prickly Pear Cays, Sandy lsland, Dog lsland and Sombrero, where snorkelling is also good. By the second week propagation had improved slightly, although it was still hard going, without any great pile-ups such as I experienced the very first evening. One day l visited Paul, VP2EXX, and his father Bill, VP2EWM. They are also Americans, and Bill has been working on a contract in Anguilla since November 1988. Paul does not work, he operates radio – a lot! Since they moved to the island, Paul has worked 303 countries – I did not realise so many countries had been active in so short a period! I was even more impressed when Paul said that the great majority of these were worked using verticals and wire antennas, as they had only recently acquired their Cushcraft A3S beam, courtesy of JA2EZD, who recently operated from their QTH and left his beam behind as a thank you. However, they have an excellent location on a 200ft cliff on the north coast of the island, with a clear sea path take-off from west lo east, taking in all of the USA, Europe and Africa. The beam is only about 25ft high on a scaffold pole, but is right on the cliff edge so it has an effective height of over 200ft in all directions other than south. Paul is still only 17 years old, and went on his first DXpedition when he was but 15 – he was one of the highly-successful KP2A/KP5 Desecheo lsland operators (see the November 1989 CQ Magazine for Paul’s account of this expedition). I took over the controls of the VP2EXX station, poked the beam towards Europe and stoked up the MLA2500 linear. Within minutes there was a howling pile-up and less than an hour later 200 QSOs were in the log. What a difference a beam and a bit of power make! I was interested to determine how much difference the excellent VP2EXX location made, so when l got back to Rendezvous Bay (at sea level and on the south coast of the island) Peter, G3SJX, gave Paul and me comparative reports on 15m. Oddly enough, Paul (using just 100W now) was only 5 - 6dB stronger than me, despite the fact that he was using a beam and I a vertical. We concluded that the QTH makes less difference than most would imagine. Paul suggested that I take a look at the famous VP2EC contest station location on the north-east coast of the island. This is owned by KC5EA and N5AU and consists of a remote house on a hill top with two 110ft towers. At present there is no mains electricity there – though they have a 10kW generator – and the house is only used for the annual WPX contests. Paul suspects that more towers will be going up and it will become one of the really big Caribbean stations to rival P40V. Being midsummer, I was not expecting any great propagation on the low bands, but I did try one or two skeds. Roger, GW4OFQ, called me on 21MHz one day and we arranged a 7MHz sked at my sunset. This was accomplished with ease, so we tried 80m. I heard Roger immediately, but he was obviously having problems hearing my 100W and it was some time before Roger found a clear enough frequency to copy me. Eventually my signal peaked sufficiently, but by this time I was copying Roger at 59+10dB, an outstanding signal, considering that I could not hear any other stations on the band – no Ws, no other Caribbeans and no South Americans. Eventually I also exchanged reports with G4PEL and two Italian stations on 80m, but it was hard going and I now know why one only rarely hears Caribbean stations on the low bands in Europe, and especially in the summer months. After 11 days of fairly casual operating interspersed between sightseeing, visiting other amateurs, swimming and going out for meals, I had worked just over 1200 QSOs. lf conditions had been better – or if I had had a beam and / or linear – I feel sure I could have worked two or three times as many QSOs without spending any longer on the air. However, it was all good fun and it was good to hear so many familiar callsigns from the other side of the Atlantic.